Our whole family was part of the wedding. John and I both participated in the ceremony. John did the bulk of the ceremony; vows, sermon, etc . . . I addressed the friends and family and prayed. Luke was an usher and LOVED showing everyone where to sit, as long as they could keep up with the fastest usher ever! Logan and Mikayla were in the wedding. Logan was the ring "tiger", which goes back to a year ago when John and Elizabeth got married and Luke was the ring bearer. Logan was feeling quite left out because he didn't get to wear fancy clothes so when asked what we has doing in the wedding he said he was the ring "tiger", obviously misunderstanding Luke's role as the ring "bear". Tommy and Stephanie got quite a kick out of that story so Logan was given his shining moment at the ring "tiger". Mikayla was the flower girl. All this being said, I was slightly concerned how this would all play out. Keep in mind, John and I are at the front with the groom and groomsmen and Logan and Mikayla have to walk down the isle. Even thought Mikalya is only 19 months old, she wasn't who I was most concerned about. Logan's idea of a good time is not being told what to do and then having everyone staring at him! To start them off we had Mikayla strapped into her stroller and Kristin Sloan fed her fruit snacks (provided by Sara Bowman) until the last possible moment. Then she let her go, I knew she wouldn't hesitate once she was let loose! Logan on the other hand, made it somewhere between 1/2 way and 3/4 of the was down the aisle before he stopped threw down the batman figure he was carrying with him, put his arms straight down at his side, gave his classic "Logan look" and just stood there with his head down! Mikayla stops, goes over, picks up his toy, brushes off his feet, grabs his arm and pulls, saying "Mon, mon" (Mikayla's way of saying "Come on!") Luckily the first bridesmaid was on her way down, so when she met up with them she grab each of their hands and escorted them the rest of the way down the aisle. They stood next to us for the rest of the procession, then they went to sit with Scott and Ann Ellis. Scott later told me that when Logan went over to him, he said, "I was just embarassed." 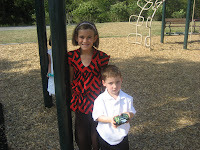 Here are a few pictures of the kids! 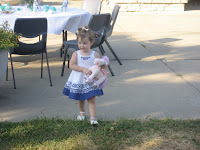 Mikayla carrying her pink pony from Tommy and Stephanie! 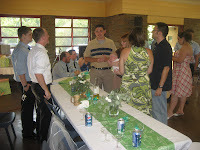 The groom is in the white shirt and talking with friends. 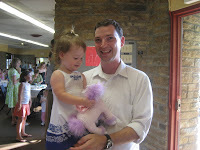 John and Mikayla, she is such a daddy's girl lately. We took video of her crying this morning when he left. John's favorite picture from the wedding. 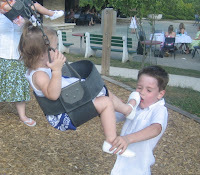 Mikayla kicking Luke in the fact on the swings, OUCH!